The Dutch-bred horse Unitas represents the United States of America at the World Championships for Young Dressage Horses in Verden (Germany) on 3 - 6 August 2006. The pedigree (Niagara x Harald) and the old style conformation of this top dressage horse is quite remarkable nowadays. Unitas and his owner/rider Teresa Butta-Stanton are the winner of the 5-year old dressage horses at the selection trial for the eastern division of the United States for competing at the World Championships for Young Dressage Horses in Verden. During the announcing of the results, the American international jury said: "Teresa, this is the type of horse we are looking for." Because of the general trend in warmblood breeding towards a lighter type horse, the fans of Unitas were worried that perhaps the juries would have prejudices against the old style conformation. Also, Unitas is quite unusually bred with respect to the present specialization in the KWPN-breeding. 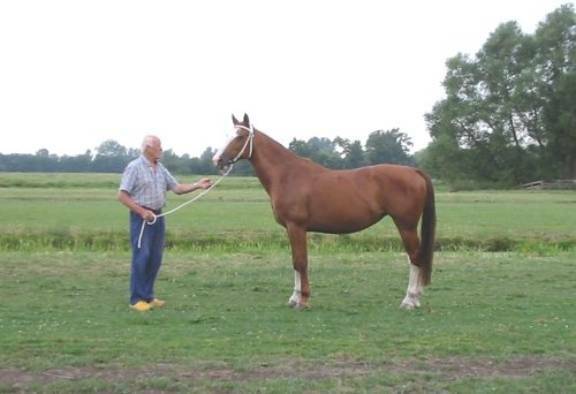 His sire, Niagara, is a specialized jumper and is his dam, Nellyzora, a pure Gelderlander driving horse. Because of that Unitas is an F-1 product and belongs to the category of horses that made the Dutch sport horses world-famous 30 year ago. An F-1 product springs from crossing two genetically diverse breeds. In this case, a mare with multi-purpose Gelderlander blood and a stallion with specialized jumping blood. The F-1 generation is strengthened and healthy through the heterosis effect, which by crossing once has the opposite effect of inbreeding. In the meantime, the strikingly large number pure Gelderlander horses that reached the top of the world since then has made it clear that the success of the Dutch F-1 horses is not only indebted to the heterosis effect. The KWPN-horse Unitas is the type of horse the American international jury is looking for. As a result of the success of Unitas, reactions from Americans that know Dutch breeding quite well have appeared on the internet about his unusual conformation and pedigree. Bill Wertman, stallion owner and closely connected to the international dressage scene in America writes: "The winning horse, Unitas, made me think of the favorite phrase used by Buckminster Fuller: 'Specialisation is the first step towards extinction'. Niagara x Harald is probably a one time combination, but proof posive that the KWPN should not throw the baby out with the bath water. Very nice horse, well ridden and well trained. Stupid me, but I thought that this was what we were all after. I was sure tickled to see them win." Scott Tolman, the stallion owner for whom, among others, the KWPN keur stallion Zeoliet stood at stud in America, writes: "Perhaps we all should be importing Gelders and old style driving mares for our dressage programs—then breed them to jumping stallions with good movement. Big, sound, athletic, rideable horses with good movement, balance, and a brain…the cross certainly worked for Unitas." He writes also: "Now is the time for North-Americans to be buying Gelders fillies and importing them. Due to the new ‘definition’ of a Gelders horse by the KWPN, these horses are rapidly leaving the population". The sire of Unitas, Niagara, has been bred totally as a jumper with the blood of Libero H, Lucky Boy, Jasper and Sinaeda. At the KWPN stallion performance test for ridinghorse stallions, Niagara got the following test results: "Honest, trustworthy stallion. For dressagehorse insufficient talent. For jumper amply sufficient till a lot of talent". His breeding index for dressage is 88 and for jumping 117 (average of all stallions is 100). Nellyzora, the dam of Unitas, is one of the very last pure Gelderlander-bred carriage horses, with the pedigree Harald x Allegro x Marconi x Erasmus x Commander x Sirius x Zadonis. Since the last of the Gelderlander carriage horse stallions was gelded some years ago, this kind of carriage horse can no longer be bred. Nellyzora was bred by Leen van Vliet from Oudewater. Mr. Van Vliet is also the breeder of the old type carriage horse stallion Tourist. 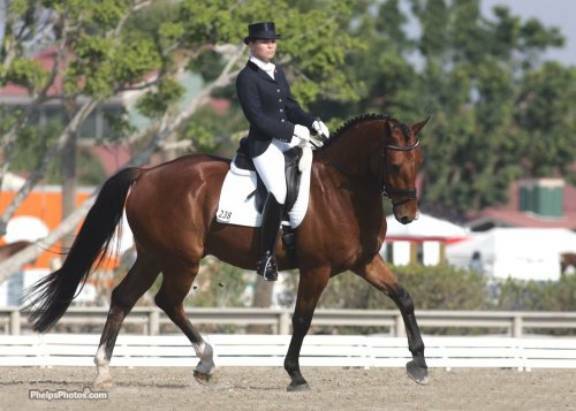 Tourist is the sire of some top dressage horses, of which the pure Gelderlander, Dikkiloo, who competed for England in the Olympic Games in Sydney, is the most well known. The six generations before Nellyzora have been bred by Aris de Vries in Stolwijk, one of the most outstanding breeders in South Holland. All his mares are in the dam line of Unitas are keur or kroon. But the lineage begins with the mare Topsi, a mare with unknown pedigree that his father bought in 1939 to replace their own horse that was requisitioned by the Dutch government for stopping the German army. The father of Aris de Vries saw Topsi at the large horse market in Utrecht and said immediately: "That is she. That horse I must have". Since the horse was no longer for sale because it had already been sold to someone else, he sought out the new owner. He managed to acquire the mare and Topsi became part of his stable. This mare became the founder of the Zora-line from which the approved old style carriage horse stallion Batoni is also descended. At his marriage in 1953, Aris de Vries got a filly out of Topsi as wedding gift, and he also received Topsi on temporary loan for doing agricultural work. After a day’s heavy work in the field, the horses were also used for the riding sport in the evening. This was quite normal then. Therefore, the Gelderlander horse has become a multi-purpose breed with much quality. Within the carriage horse breeding, the now eighty year old Aris de Vries continued breeding with pure Gelderlander bloodlines for many years, and he still is of the opinion that we have to be very cautious with the influence of Hackney blood because of the character. The only horse that he currently has is the carriage horse mare, Lady Zora, that by her sire, Ganges, has 12.5% Hackney blood, but has a really good character. Nellyzora, one of the very last pure Gelderlander bred carriage horses, is the dam of Unitas. The breeder of Unitas is Andries de Vos from Benschop. He bought the dam, Nellyzora, as a foal. Although he has been breeding horses for many years, she is the first mare with which he is breeding within a studbook, but he continues making his own decisions. He selected the jumping stallion Niagara because he thought that he was a mighty stallion that was also incredibly quiet. Andries de Vos has also bred another good dressage horse by the stallion Niagara out of a mare by the stallion Indoctro, a sire of good jumpers. This horse, Valentino, two weeks ago won at the Centrale Keuring of Utrecht the selection for the PAVO Cup for 4 years old dressage horses. The stallion Niagara stands no longer at stud in the Netherlands, but was sold to America. Nellyzora is now in foal by the NRPS stallion Kentucky. Together with his son Leon, who is now the owner of Nellyzora, Andries de Vos harnessed the mare when she was three years old. She is wide awake, but very docile. There wasn’t any problem with her. She does everything for you, and she was never ill. Leon de Vos is very happy with Nellyzora, although her old style conformation and pedigree don’t fit enough to the modern carriage horse breeding to become a star mare. She is for him an excellent horse for recreationally driving and has proven to be a fantastic breeding mare too. Teresa Butta-Stanton has invited the breeders of Unitas to attend the World Championships for Young Dressage Horses in Verden and has expressed an interest in other foals out of Nellyzora. Teresa is 31 years old and is active as a fulltime riding instructor and horse trainer. She decided two years ago to buy Unitas when she saw him on a videotape of horses for sale in the Netherlands. She said immediately: "That’s the horse I want. That’s the trot". Thereupon Unitas was sent to be saddle broken, and Teresa flew to the Netherlands to ride her new horse for the first time. When she got off she said: "I’m going to Verden with this horse ". That they have come so far, according to Teresa, is by the willing and calm character of Unitas and that he always does his very best. Four horses are representing the United States at the World Championships for Young Dressage Horses in Verden: the KWPN-horse Unitas, a Belgian Warmblood and two Oldenburgers, of which one is bred in America. This horse, Brigadier, also has part KWPN-blood, for his dam sire is the pinto stallion Art Deco, who was born in the Netherlands and stands at stud in America. Art Deco is a son of the 30 year old pinto stallion Samber. Both Art Deco and Samber became Grand Prix dressage horses. Just as Unitas, Samber and the dam of Art Deco are also F-1 products but from old style Groninger mares.